This weekend included lots of blogging, writing, research, errands, and time spent at home. Due to the oldest mini's request not to do anything for Family Fun Day, we had even more time to do a few things around the house (read more about that incident here: http://ashlen-kidspert.blogspot.com/2014/08/a-lesson-on-consequences.html). The kids kept themselves preoccupied while I got my writings done on Saturday. Elizabeth used a box of tissues because her doll "poop. Poop everywhere." She then cleaned the dolls head, hands, feet, and tummy. The boys made their own band. I don't foresee them going big. They made a fort covering our entire bedroom. They made use of pack n' plays, extra car seats, blankets, pillows, dressers, and night stands. The fort fun was put to a halt when a certain lil Miss peed somewhere in the tent (no one knew exactly where so the whole room had to be cleaned). Fun stuff. Picking out animals in their National Geographic Kids! The three minis have more than enjoyed this birthday gift from Great Grandma and Grandpa Harmeyer. Elizabeth shares in her oldest brother's obsession of "Teenage Mutant Ninja Turtles." The boys asked if we could go rock climbing on Saturday. I said no (Matt was at work) and said I'd look into places we could take them sometime. They responded "okay, we're just going to go rock climbing in the backyard." I said okay and continued my work inside. 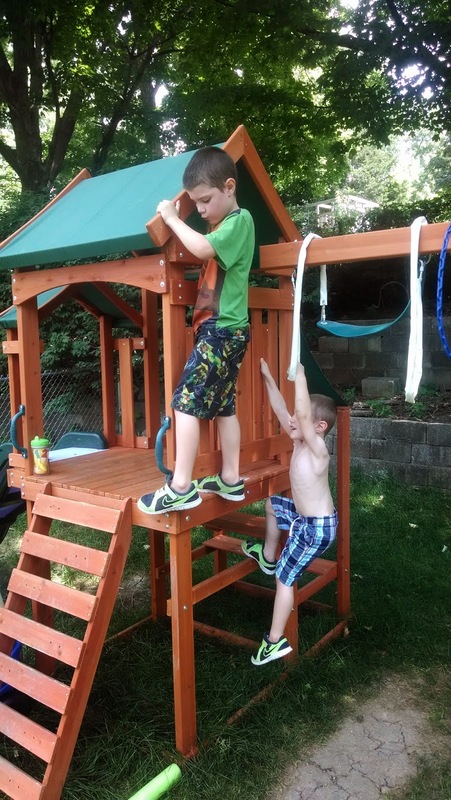 I should have thought about their statement more because when I checked on them minutes later, I found them climbing ON TOP OF the swing set, claiming to be "on top of the biggest rock." Sunday morning Max dashed our ideas for our Family Fun Day, so we made a big breakfast at home. 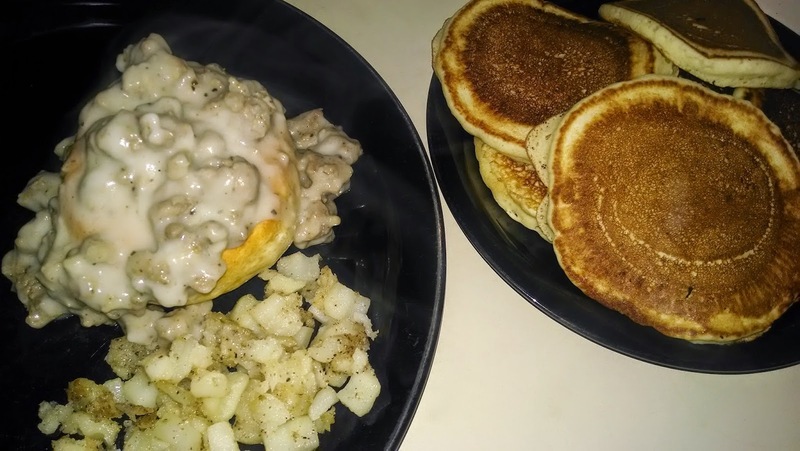 Pancakes, hashbrowns, biscuits and gravy, and sausage. It was delicious! We tried out Small Cakes in West Des Moines (we got our cupcakes to go). The kids approved. Bubble pool with a slide on the hot, no napping afternoon. The kids helped me set up the week's sensory sandbox. Not sure what we're calling it, but it included blue sand, blue beads, plastic fish, and sea shells. Since the minis were disappointed about not doing anything for Family Fun Day, I'm planning a semi-surprise road trip for the upcoming weekend (I may have let it slip I'm planning one, but I'm not sure how many of the minis picked up on that). Even if my kids aren't looking forward to it, I am! I spend my entire week at home (one of the downsides to working from home) and only get out and about on the weekends, so I'll be more than ready for a day not at home!